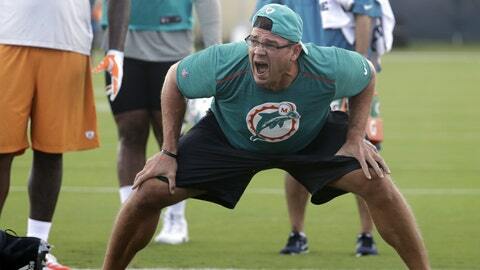 In this Wednesday, Aug. 1, 2018, photo, Miami Dolphins defensive line coach Kris Kocurek shouts as players do drills at the NFL football team's training camp, in Davie, Fla.
DAVIE, Fla. (AP) — Miami Dolphins players wonder whether Kris Kocurek’s voice will give out, and perhaps they wish it would. Kocurek is in his first year as the defensive line coach, and he operates with high expectations at high energy and volume. Not everything Kocurek shouts can be repeated, but the thrust is he’s trying to turn around a unit that underachieved last year when the Dolphins went 6-10. “I’ll just say this: I have a passion for d-line play,” said Kocurek, with a rasp. Coach Adam Gase lured Kocurek out of Detroit, where he had been the Lion’ defensive line coach. Kocurek joined the Dolphins shortly before five-time Pro Bowl defensive tackle Ndamukong Suh departed, but Gase still believes his front four will be better this year. While Kocurek can be hard on his players, he also knows how hard the game can be. The 39-year-old Texas native played at Texas Tech, and after he was drafted in the seventh round, his NFL career lasted one game and four snaps — for Tennessee in 2001. After a fifth shoulder operation ended his career, he turned to coaching and reached the NFL as a Lions assistant in 2009. When Detroit coach Jim Caldwell was fired in January, Kocurek came to Miami. He’s working with perhaps the team’s deepest unit. While Suh is gone, Miami acquired two-time Pro Bowl end Robert Quinn. Holdovers include ends Cameron Wake, Andre Branch and Charles Harris, and tackles Jordan Phillips, Vincent Taylor and Davon Godchaux. Kocurek yells at all of them. Burke said Kocurek’s passionate approach is a good match for the area he coaches. Wake, for one, loves Kocurek’s approach. But will Kocurek’s voice make it through training camp?